I only own this for the last page, which was a double splash page, which features Kitty Pryde. I really like how the first three pages are made out to be an old school comic. Having Sal Buscema provide the art, was a nice touch. 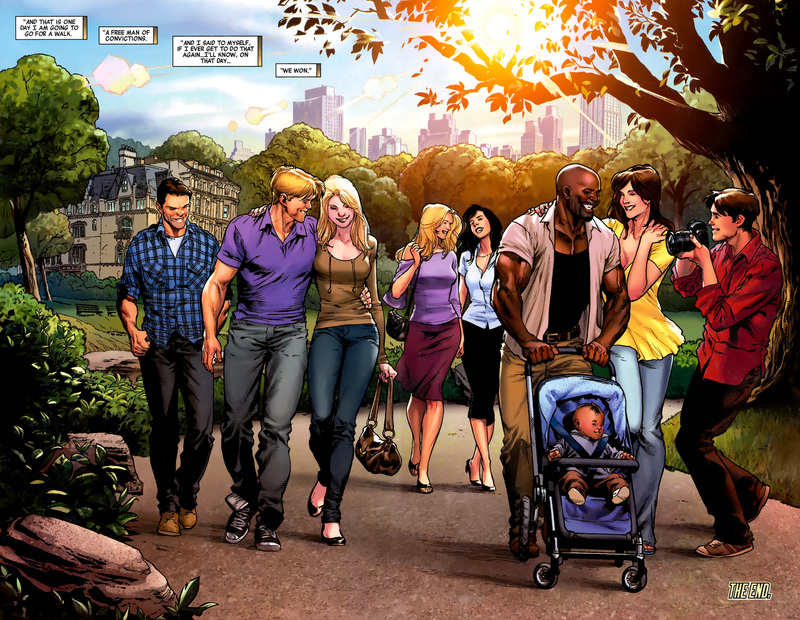 These pages are part of the cover story Joe Quesada and Marvel, with the help of Wizard Magazine, did to sell The Sentry. The story they tried to sell us on was that Sentry was a character Stan Lee created in the early days of Marvel. With his legendary poor memory, he forgot about the character until someone found the character sheets one day. The concept of Marvel’s version of Superman, was enough to sell me on giving the original miniseries a chance. I bought that one and the various one shots that were released. Marvel had to sell the character as a forgotten Marvel, as that was also the in-universe explanation as he apparently was a mainstay of Marvel. Something happened and everyone forgot who Sentry was. Sentry has a dark side, The Void. The Sentry gets his powers from the sun and Void from the darkness. Get it? 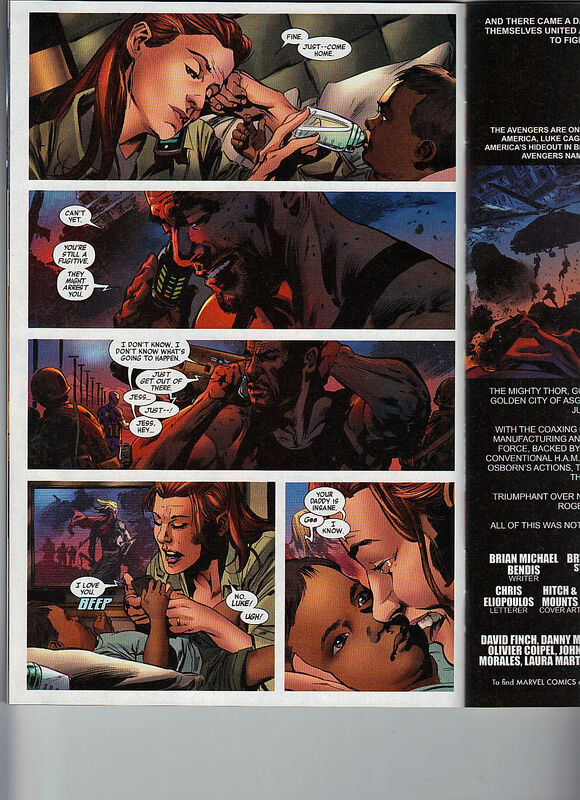 I like that Bendis credits Paul Jenkins, the actual creator of the Sentry, for the original three pages. It is the least he could do as the final panel of the third page transitions us to a cave wherein Sentry is reading the comic book. 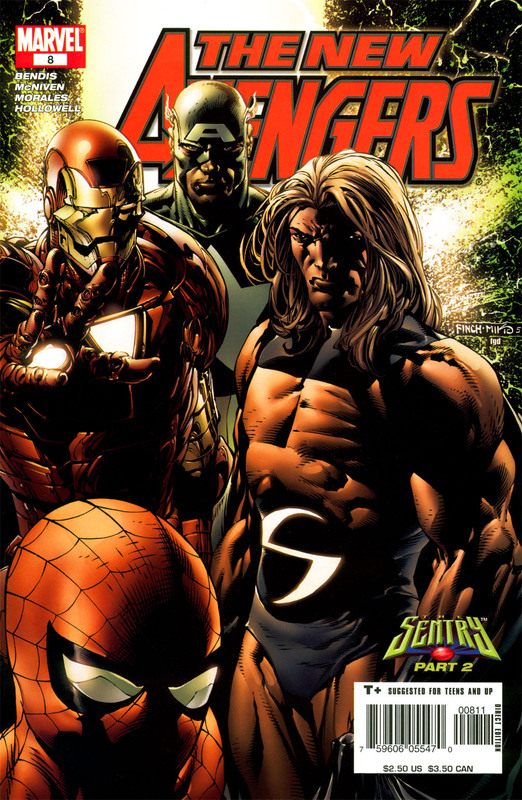 In the cave with the Sentry is – Captain America, Iron Man, comic writer Paul Jenkins and Sentry’s wife, Lindy, who the Sentry believes is dead. Everyone is confused by the Sentry’s presence. SHIELD Helicarrier, One Week Ago. Iron Man is trying to recruit Wolverine to the team. Iron Man thinks Wolverine joining the team, will help his image. He needs is as Mark Millar and John Romita Jr. just completed their amazing run that had Hydra kill Wolverine, bring him back and control him. Enemy of the State / Agent of SHIELD, was the name of the two arcs. 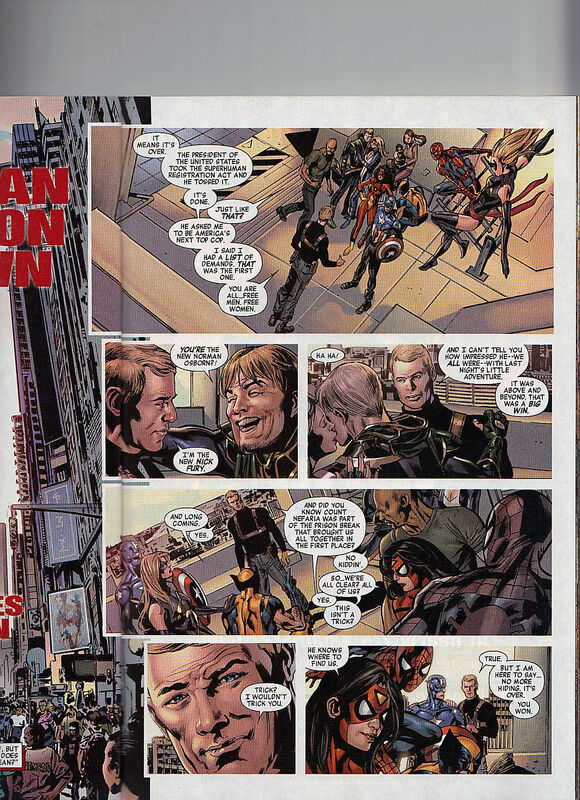 There is an awkward white square that is stapled into the comic right here between the comic page and the ad for the 90s Spider-Man : Venom Saga DVD. 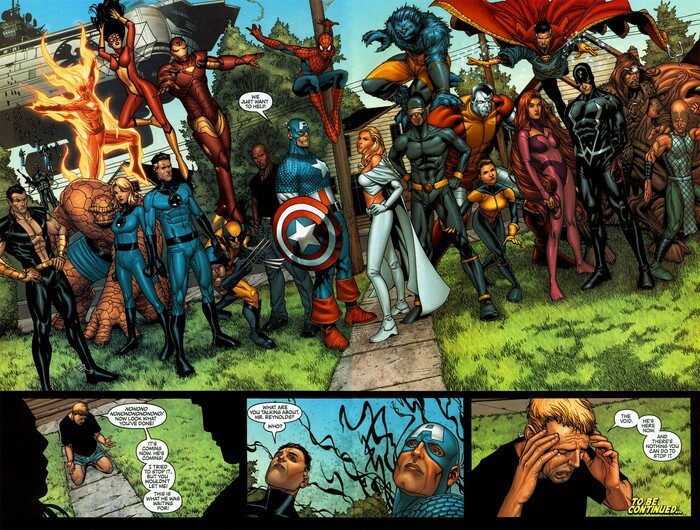 Tony hints that standing next to Captain America, makes yourself want to be a better person. He needed that when he was hitting rock bottom, which apparently Wolverine doesn’t know about. Since all of the pep talk isn’t working, Tony decides he will just pay Wolverine to be on the team. Today. Long Island. The Wrecker is tossing Wolverine about a neighborhood. 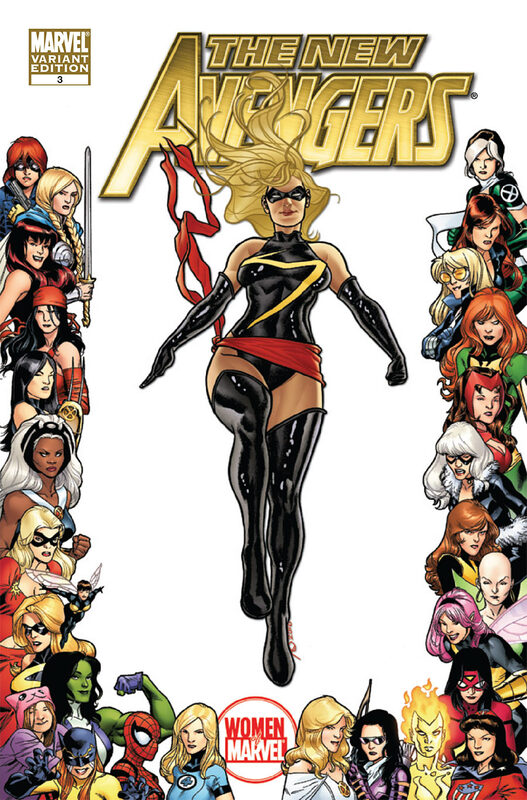 The only Avenger still standing is Spider-Woman, who I believe is really Veranke, the Skrull Queen with enhancements to give her Jessica Drew’s powers. 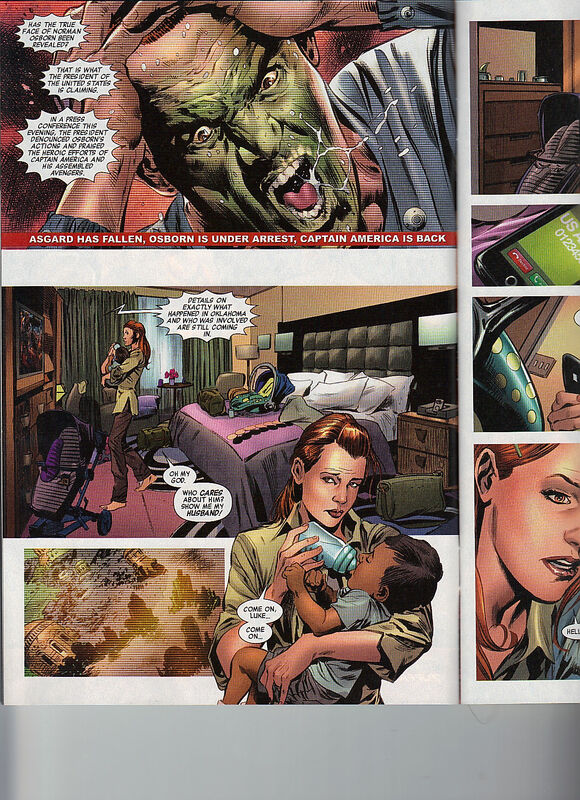 She is secretly setting up Secret Invasion, Norman Osborn will kill her a few years from now. Spider-Woman gets inside Wrecker’s mind, asking him what he really wants out of life. Arizona. Lindy is trying to talk to Sentry. He can’t believe she is alive. He creates a burst of sunlight and disappears. The first Fantastic Four film must have just came out as thee are several ads for the film and merchandise for it. Poor Paul Jenkins fainted. Sentry is gone. Bob Reynolds wakes up, grabs some food and watches some television. Back to Spider-Woman and the Wrecker. There is an insert for Entertainment Weekly subscription. I’m glad this practice isn’t still used today. Wrecker talks long enough for Wolverine to get back into the fight. He slashes Wrecker’s back. 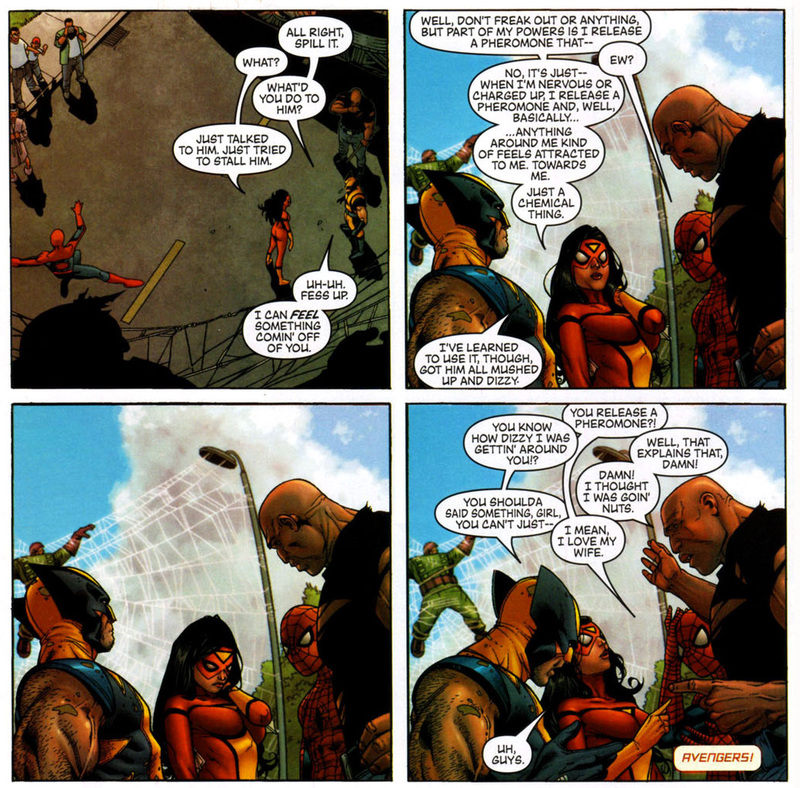 Spider-Woman uses Wrecker’s magical crowbar, tosses to Luke Cage and he hits Wrecker with it, as well. Cage decides to keep the crowbar, going forward. Spider-Man webs up Wrecker, the day is saved. I keep wanting to type, Wreckler, what is that about? This is a great page! We learn one of Spider-Woman’s forgotten powers and it is actually a funny moment, too. Spider-Woman reveals she emits a pheromone. In the Facebook : Avenges Alliance game, this power emits fear. Its a waste of a move. Wolverine was getting dizzy due to it. Luke Cage was feeling nuts. Spider-Man’s “I love my wife” is so funny, he’s been having naughty thoughts! Now that stupid One More Day happened, this page is no longer in continuity. He probably said, girlfriend, now. Iron Man tells the team to assembled. Bob fell asleep in front of the television. Something I could never do. I need to have my legs up, I think. Emma Frost wakes him and tells him to go outside. It has always bugged me Kitty’s stance there. What is she even doing? Also, what is Emma doing, pointing those guns at Captain America! Cyclops looks on, approvingly. Issue ends as The Void is seeping out of Bob. I had kept issues nine and ten as there was a website that implied that since those issues take place on his front lawn, that Kitty is technically in those issues but if you don’t see her or they don’t mention her, I don’t count it. I can tell you that after this, Sentry joins the team, so there’s that. I only own this issue for the Magik appearance on the cover. I will eventually review issues 53 and 54 of this series but Jessica Jones only appears in this issue. 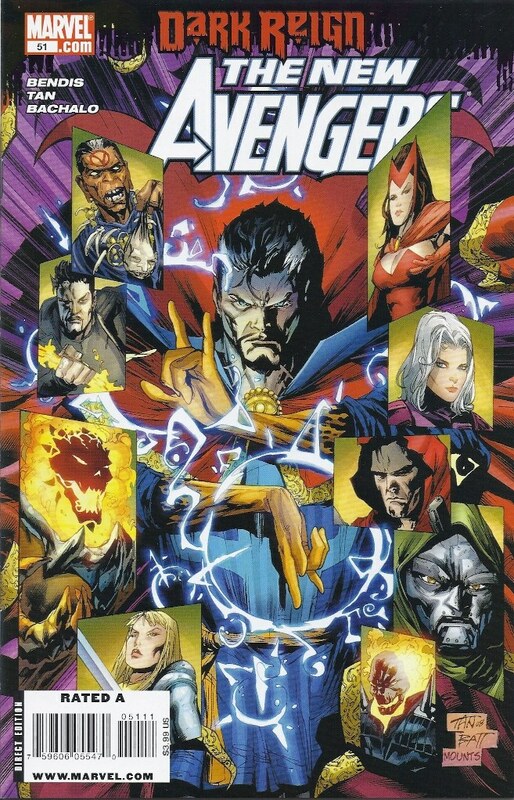 This issue is broken down into two stories, the Doctor Strange portion and the New Avengers section. So that is how the two art teams break down, which is pretty smart. 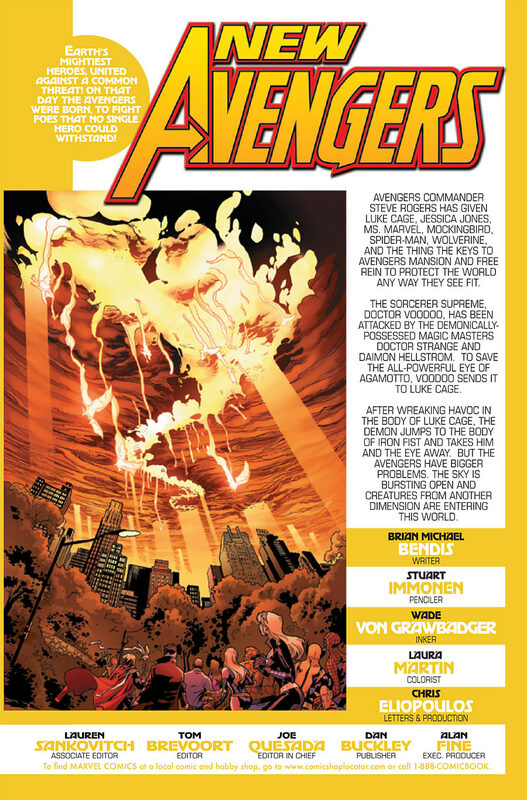 Tan gets the New Avengers and Bachalo gets Doctor Strange. Here is a quick recap of what has been going on. Secret Invasion happened, Norman Osborn killed the Skrull Queen and became Director of SHIELD, which he renamed to HAMMER – for reasons. Due to the World War Hulk, Doctor Strange tapped into some dark magic and became overpowered and had to leave for a time. The Hood’s Penthouse. The Hood has summoned Dormammu, so that he can have even more power. Avengers Tower. 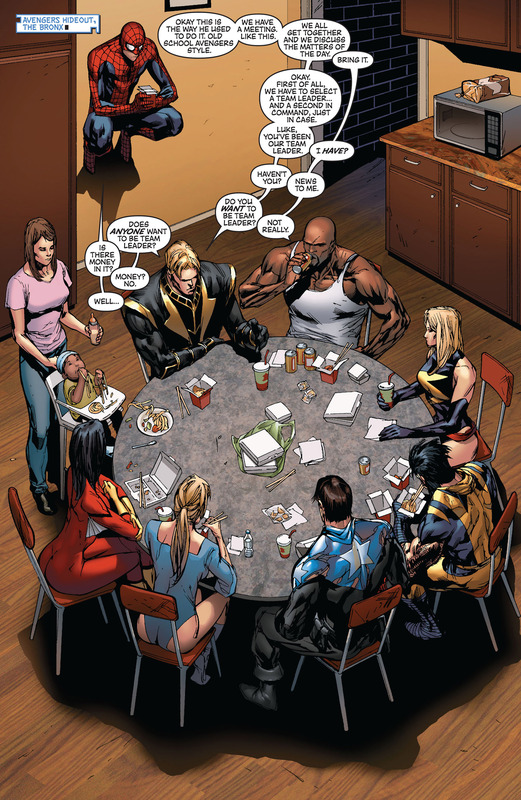 Mockingbird watches as her boyfriend, Ronin – secretly Hawkeye (to the world at large) as he goes on television to review Norman Osborn for the villain that he is. The news media is skeptical. Dover, New Jersey. Wiccan, of Young Avengers fame (and possible son of Scarlet Witch) uses his magic to prevent a car crash. Doctor Strange interviews Wiccan – as he is waiting for the Eye of Agamotto to reveal who the new Sorcerer Supreme will be. It is a real shame that Bendis didn’t make the cut to be the Sorcerer Supreme, though Bendis would sort of correct this in the Uncanny X-Men Annual 1 2014. There is a house ad for Exiles 1, the third attempt at the series, this time with Jeff Parker and Salvador Espin, it was pretty good for the six issues it lasted. Doctor Strange is approached by the suped up Hood. Th second issue of War of Kings is coming out. Avengers Hideout. The Bronx, really it is Bucky Cap’s safe house. These are my favorite pages of the issue, with one being very fun. Ronin wants to conduct their meetings in the classic Avengers fashion. There will be a leader and a deputy leader, even a handbook. Cage is surprised to learn that he has been the acting leader. No one wants the leadership role. Secret Warriors 3 is coming out. Blair Butler of G4 TV’s Fresh Ink Online states “Hickman is the next Warren Ellis, the next Alan Moore.” Which seems pretty bold back in 2009. Spider-Man offers that Bucky Cap has the military experience but he counters that he doesn’t have the Avengers experience. Jessica offers up that her friend, Carol, has military training. Carol turns it down. Since no one else wants it, Ronin will lead. Ronin makes Carol the deputy leader. Ronin has an issue, and it is with Spider-Man. Thor 601 by Straczynski and Djurdjevic start the concept of Asgard in Oklahoma. Look at that first image above, notice how all of the Avengers are maskless? Except for the one, not at the table. That is an issue for Ronin. Wolverine vouches for Spider-Man but since he couldn’t tell Skrulls from the genuine article, so he can be tricked. Of the Skrull big reveals, only one of importance is that Mockingbird is back in the world of the living. That panel of Danielle Cage (named after Luke’s best friend, Iron Fist – which I love!) eating sloppily with her hands? So true to life! Ronin wants no secrets, so he wants Spider-Man to unmask. Spider-Man is cautious as he doesn’t want to risk his family’s safety. This is Post-Civil War, where he had unmasked in front of the world – but it is also Post-One More Day, where he made a deal with the Devil (Mephisto) and rewrote time and his identity back into the hands of a few. 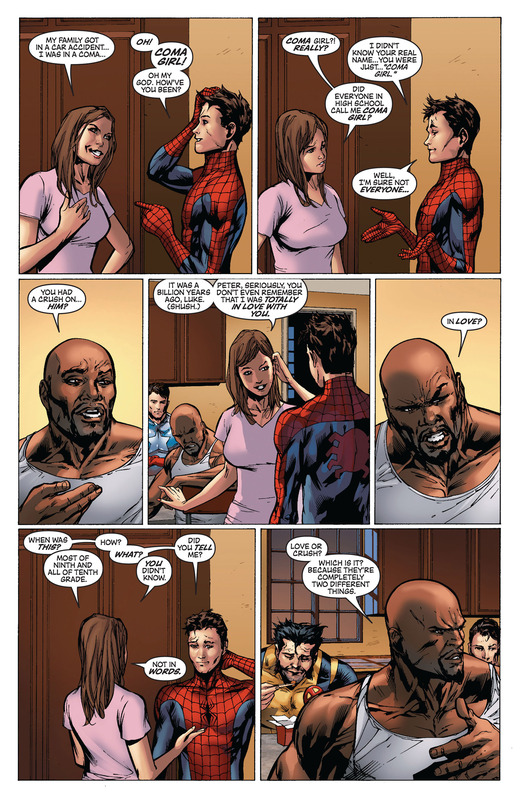 Peter Parker unmasks and introduces himself. Jessica Jones recognizes him, immediately. They went to high school together. All of this was revealed in the awesome two part origin story of Jessica’s over in Alias 22 & 23. Poor Jessica, she was even more invisible than Peter was! Peter had, at least, bullies in Flash and the popular kids, razzing him on a daily basis. Jessica was just in the background, so even Peter didn’t see her. Jessica reveals she had a massive crush on Peter, which shocks Peter AND Luke Cage! I love this page so much! Jessica knows she has to give Peter some additional information. She repeats her origin (briefly) about how she was doused by radiation and was in a coma forever. Apparently students at Midtown High School called her, Coma Girl, as they were pretty clever. She is not happy with the nickname. Luke’s running commentary is a delight. He can’t believe she had a crush on Peter, who is pretty much the opposite of, in every way. Jessica, in full flirtation mode (look at that classic hair pull!) she claims it was a billion years ago but she sure does want to keep talking to Peter. I like how the rest of the team is merely watching in silence. I imagine this is more along the lines of two friends from high school, catching up after years apart. Then she says she use to love Peter and Cage starts losing his mind. Apparently they spoke to each other in ninth and tenth grade, but he barely noticed her. Cage wants to know if it was a crush or love, which at sixteen, I’m not sure if there is a difference. Peter wishes she was up front with her feelings, as he was just stuck at home with his test tubes and eating flapjacks. Which I adore that, as a Spider-fan, that it is a term that I just know and recognize but Mockingbird and Ronin have no clue that Peter is talking about pancakes. So I believe you are suppose to read the top row, then the right panel and then move to the middle row. Those panels do seem out of place, as she just leaves and they were talking. I guess she is thinking about how life would have been different. Now that would have been a decent What If, right there! Wolverine is very pleased that reunion happened, as it was fun to watch. Peter reveals that his best friend’s father is Norman Osborn, they have a history. He leaves out that his blonde girlfriend cheated on him with his best friend’s father and flew to Paris and birthed his twin babies and then Norman threw her off a bridge and Peter broke her neck with his web. I suppose I would have left that part out too. There is a hug crash and we get Luke saying, Sweet Christmas, which I totally say too! Issue ends with Doctor Strange beaten and weakly asking for help. I read every issue of Alias and the short lived sequel series, Pulse, and I became a huge Jessica Jones fan. It was a sad day when I started selling those issues. Such a great original series. The Army & Air Force Exchange Service (Exchange) is an agency of the United States Department of Defense. Its dual missions are to provide quality merchandise and services of necessity and convenience to authorized customers at uniform low prices, and to generate reasonable earnings to supplement appropriated funds for the support of United States Army and Air Force Morale, Welfare and Recreation (MWR) programs. 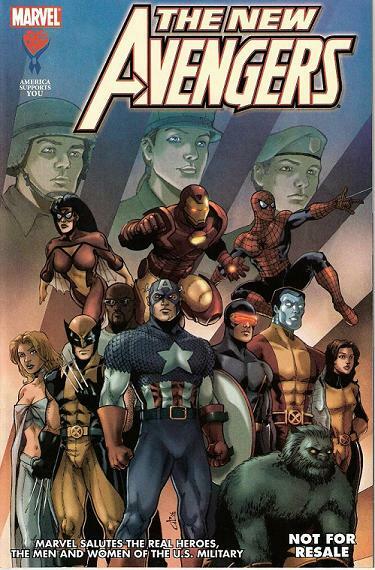 Marvel, to support the troops, creates and provides an entire free comic to the soldiers. My mother was in the Army from before I was born to when I was entering junior high school. Thus, I am partial to that branch of the military. Inside front cover has an ad for the PSP game, Street Fighter Alpha 3 Max. Issue opens with Spider-Man webbing Boomerang upside down on a skyscraper. Spider-Man is updating him on how much nicer his life is now that he is an Avenger. Even though he is fighting global threats now, he always has time for his old Rogues Gallery. As he swings away, he continues to think how good he has it. 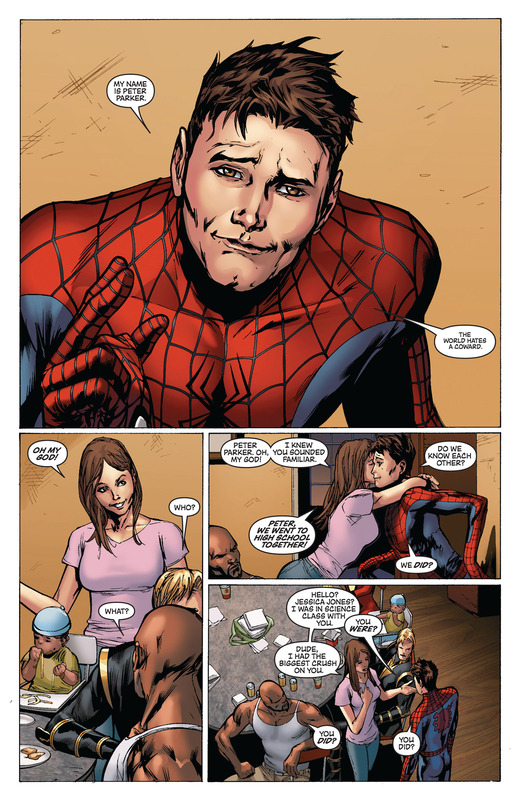 Mary Jane is happy, Aunt May is healthy and he is liked by his teammates – for the most part. Spider-Man gets to Avengers Tower. Jarvis has been knocked to the ground, and there is a portal. Jarvis tells him there was a large fight and the X-Men were involved. Spider-Man jumps through the portal. The New Avengers and the Astonishing X-Men are in WWII. 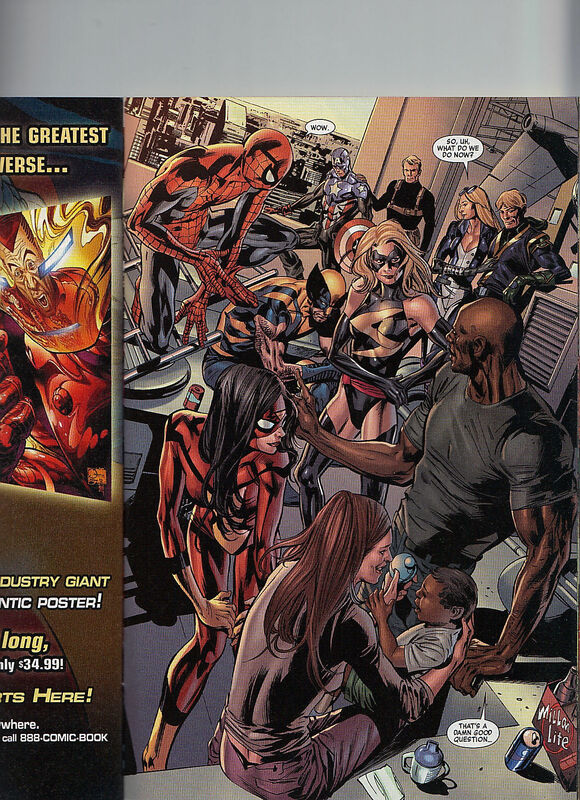 The New Avengers are – Spider-Man, Spider-Woman, Iron Man, Luke Cage and Captain America. 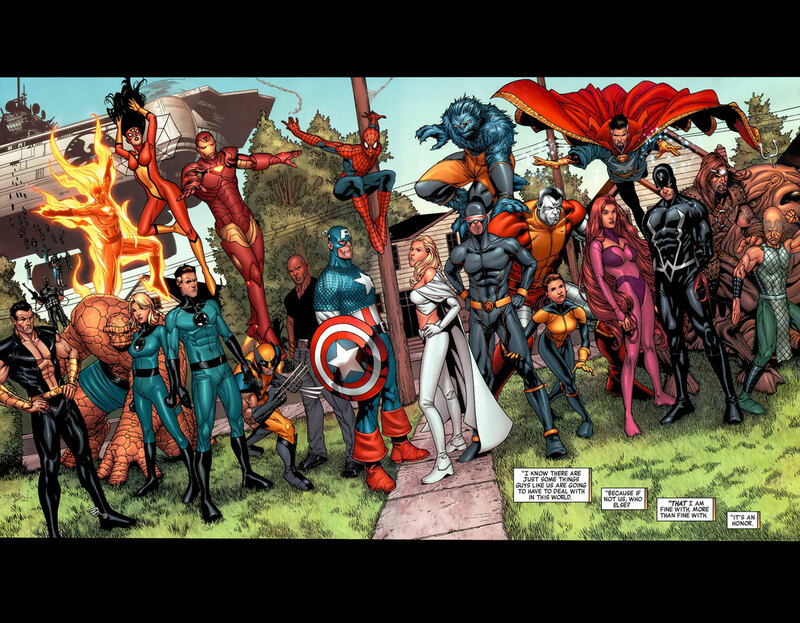 Astonishing X-Men are – Emma Frost, Wolverine, Cyclops, Colossus, Beast and Kitty. Technically, Wolverine is a member of both teams. 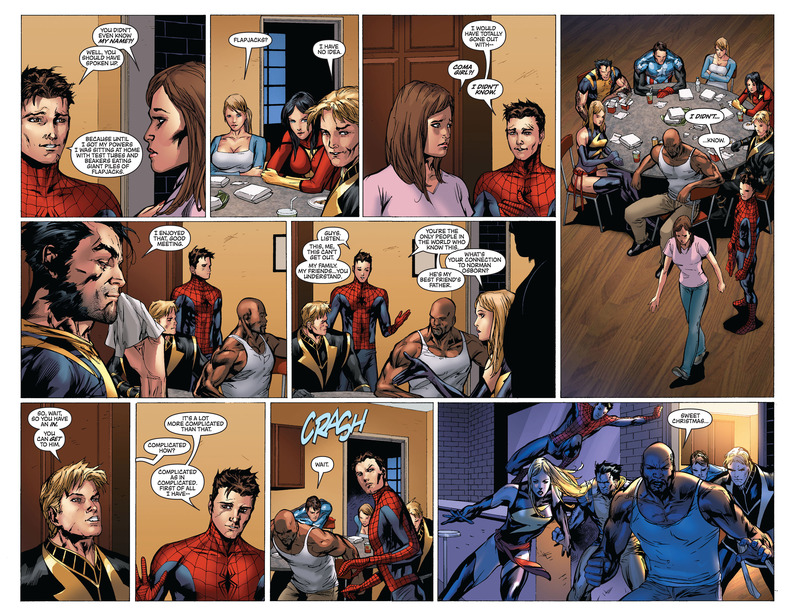 Iron Man commits two pages to updating Spider-Man on what was and is still happening. Kang the Conqueror has attacked the Tower. Then he attacked minutes later but for Kang, it was four months later. I do like how Kang doesn’t go farther into the past with each new attack. He likes the challenge so he picked a moment in time and has rarely gone before it. During the first attempt, Kang brainwashed the X-Men into attacking the Avengers. Kang left behind some technology. Now Kang’s plan is to kill WWII Captain America, thus the Avengers will not be the force they are now. Which will also be a rough plot to one of the What If Age of Ultron issues. The heroes used one of the portals to jump back in time. 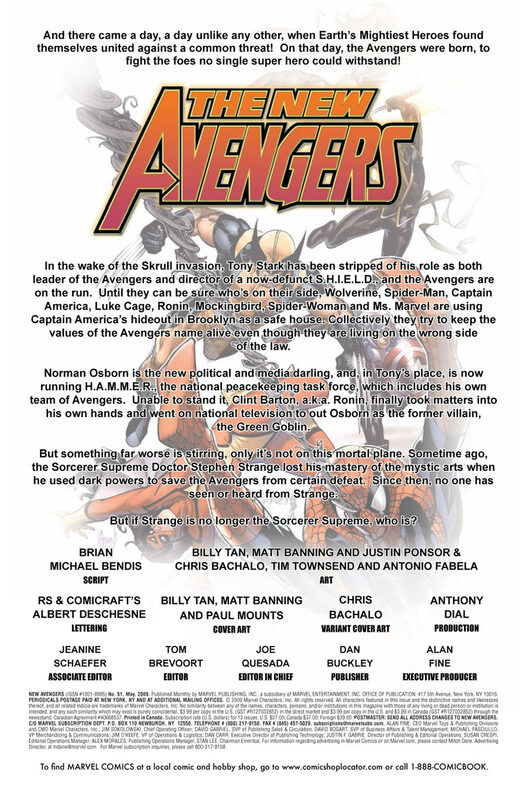 There is a full page house ad of Marvel heroes supporting the military. 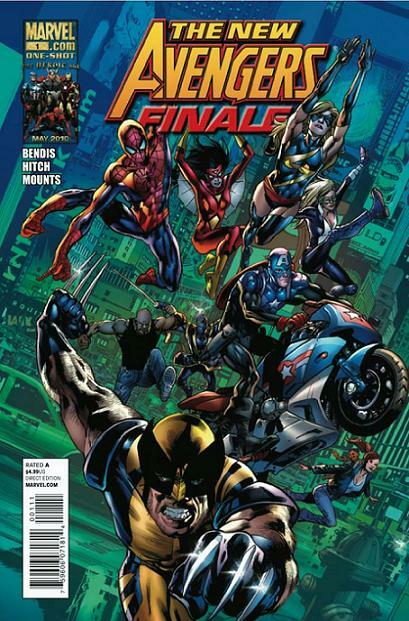 Heroes present are – Iron Man, Hulk, Captain America, Wolverine, Thing, Sue Richards and Spider-Man. Instead of Spider-Man, they were hoping the Sentry would have entered the portal. There is an ad for Rubbermaid – because bright, crisp colors aren’t just for comic books. Which, even though there are vegetables only shown, took me a few seconds to figure out exactly was meant. The plan is to fight Kang and his robots until there are no more robots or Kang gives up. They have WWII Captain America hiding somewhere. Spider-Man asks the question of why they don’t go farther in time to prevent Kang from attempting this latest plan. Iron Man tells him that they can’t control the portal, it is dependent on Kang. There is an ad for Samsung – immerse yourself in the experience. I like how these ads are clearly some type of partnership so they can’t advertise a specific product – just their brand name. Cyclops and the X-Men finally makes a proper appearance. Cyclops tells them that they can’t risk losing any of the brave soldiers, as that could trigger a change in the time stream. Though, wouldn’t it only create an alternate timeline? That is typically how time travel works in the Marvel Universe. Kitty quips about how that doesn’t add any pressure. Emma is quick to tell Kitty that they are the X-Men, not the New Mutants. Kitty calls her a cow – such an uncalled for comment from Emma. Beast is trying to figure out how Kang controls the robots, so that they can skip having to fight them. There is an ad for the PSP. There is a pretty nice poster of both the New and Young Avengers teams. The text in the bottom is – AAEFES has always gonr and will always go where you go as we have for the last 110 years. Also an ad for Leatherman, which looks like a Swiss Army knife type of tool. There are ads so you can take out the poster and not lose story pages for the reread. That’s planning ahead. Nice splash page of Kang, making his first appearance in the issue. Colossus fastball specials Wolverine at Kang. Kang blasts Wolverine away. The original Howling Commandos parachute in. Luke Cage is impressed. Fury tells Cap they can offer a hand. Spider-Man makes a bad joke that what they need is their guns – I had to read it twice to make sense if it. Fury shoots him a look, with both eyes! Spider-Man tells him that he gets that look from Future Fury quite often. Kang wants WWII Cap, he threatens to kill them all if they don’t comply. 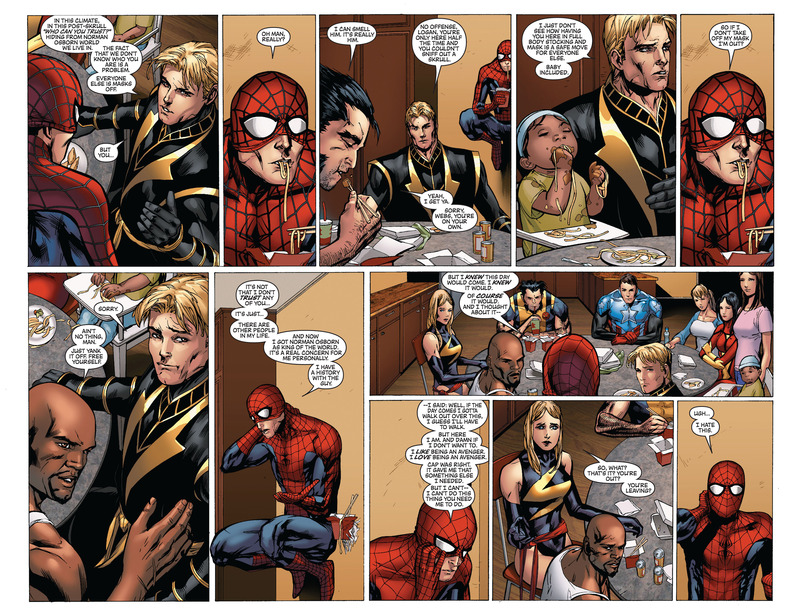 Spider-Man jokes to Iron Man that Kang should know that the Avengers have beat him before and can again. Iron Man tells him that the villains never remember that. Which is a nice observation by Kirkman. 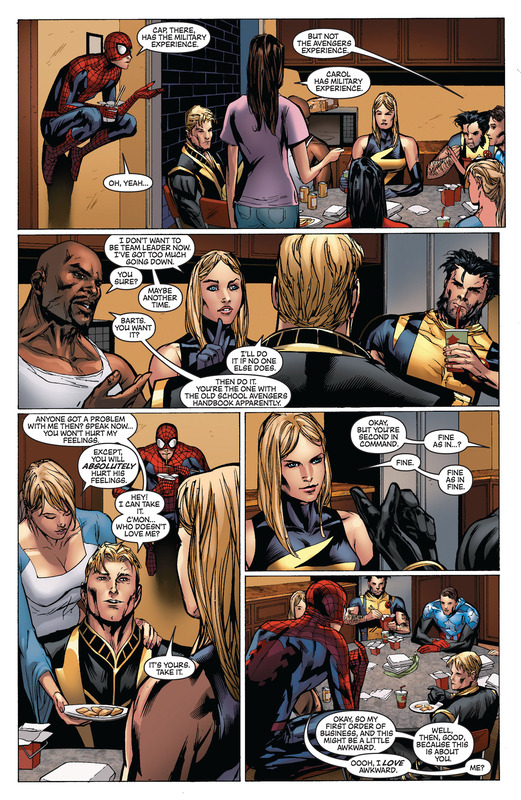 Cap tells Emma, Spider-Man and Iron Man to get the injured soldiers to safety. Wilson, a true testament to American craftsmanship. This is the ad that I noticed that the brands had no products specifically shown. There is an ad for Top-Flite, a brand I am not familiar with. They make golf products. WWII Cap shows up, finally. Spider-Woman was doing her best to hide him. This Cap confronts Kang. If the future without him is truly horrible, he will surrender. So Kang and he go into this alternate future. Spider-Man wishes Reed Richards was there to explain the ramifications of these actions. Iron Man is insulted as he is a world class genius, in his own right. Iron Man echoes my theory that what should happen, is a divergent timeline would be created. Kang brings Cap back and surrenders. The future without Cap was okay, the Avengers have a little harder time with challenges but they still overcome. Young Cap is surprised his older self, isn’t that much older. The heroes come back to the present. Wolverine is going to stick with the Avengers for the moment, as they have a bigger TV. Kitty likes the idea of a bigger TV. Jarvis is left to clean the mess up, by himself at issue’s end. Inside back cover ad is fot Igloo, and not a cooler in sight. Back cover ad for the PS2 24 game, which wasn’t bad. It takes place between seasons two and three. Three is my favorite season. That moment with Jack Bauer, the terrorist’s daughter and the inflicted hotel? I still reference that as the most bad arse moment of the series. Jack in body armor in the eighth season, going after the former president, might be the second place holder. I knew that president was corrupted, simply because the actor resembled Nixon to me.